The wait is over! 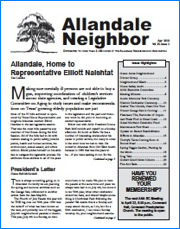 The October 2010 Edition of the Allandale Neighbor is being delivered to your doorstep now. This edition has a lot of what you were hoping for – articles on Allandale matters that matter to you. Thanks to all of the volunteers and their contributions to the October newsleltter. In this issue, we start out with an article about the tree planting at Lamar Middle School, a beautification initiative that equally benefits the school, the neighborhood, and anyone passing through the intersection of Allandale and Burnet Rd. Next we cover the real estate market in Allandale. We asked local realtors to give us their take on number of sales and days on the market and how Allandale compares with other areas of town and the nation as a whole. In a nutshell, not so bad. Looking for guidance on where to eat out? As always, Laura Dooley did a splendid job of seeking out restaurants near and not so far and came upon a recent addition, El Chile Cafe y Cantina on Greystone. I've already checked it out. Thanks to Erik Brewer, our very talented sports writer who wrote an article on the McCallum football team's season. Erik is a student at McCallum, writer for the school's newspaper, and a player on the team. I think you're getting the idea. This is just a few of the articles you'll find in this edition of your neighborhood newsletter. We cover this year's pecan harvest (Walter Brewer), more Allandale history (Bruce Reilly), sustainable living (Jim Roberts-Miller and Steven Zettner), plus a photo page of yard art. As always, we like hearing from you. Send your ideas and comments and/or announcements to allandaleneighbor [Email address: allandaleneighbor #AT# gmail.com - replace #AT# with @ ]. We post many of the stories online where you can share your comments. Just click on the comment link at the end of the article. Of course you can always get the complete newsletter, photos and all, by clicking right here.